Wheels: 14 x 5.5 Radial Tires (BSW): ST205/75R14 "C"
GVWR (unit weight plus maximum carrying capacity): 3000 lbs. 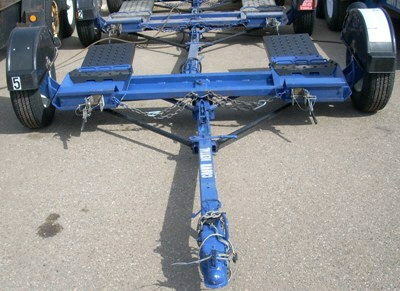 Maximum Towed Vehicle Body Width: 76"
(front wheel drive) 4500 lbs. (rear wheel drive) 4800 lbs. Full-size trucks and SUV's are too wide. * Please call us with any questions about our car dolley rentals in Burnsville MN, Rosemount MN, Apple Valley, Minneapolis, St Paul, Twin Cities, South Metro,and Dakota County.